For today, I bring you: Simplicity 1620 (now out of print). Just the blouse portion. The pants are a BurdaStyle pattern, back actually from my Pink Walrus outfit that I did for Project Sewn in February. That seems so long ago and interestingly enough, they don't look as good as they did because I've lost some weight. Yikes! I mean normally I'm all for having a little trim and fit body, but mine has come as a result of stress and not because I've actually been workin it like a gangsta. I think though, we're back on the road to filling these pants out the good and proper way - with lots of sugar and bread, aka, my comfort foods! Ha ha! Anyway, back to the blouse. 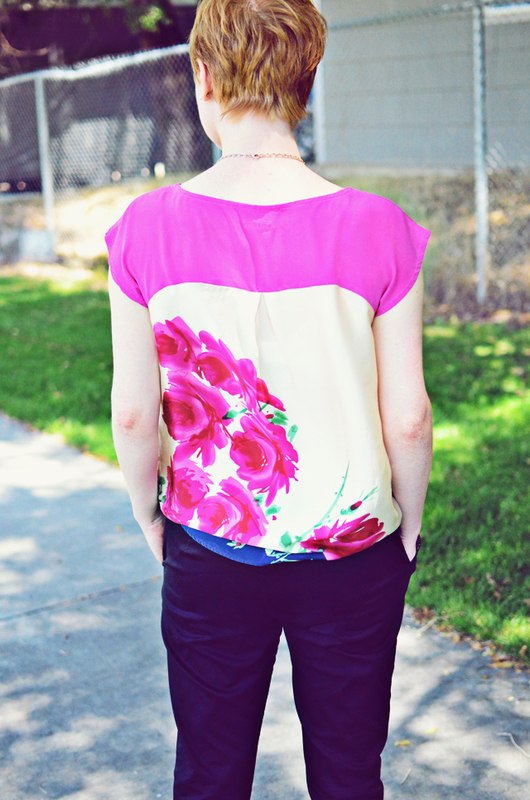 Its a really super simple, super easy blouse. Pretty much a rectangle with a few tricks like a yoke and some pleat action. I was gingerly fishing through my rather extensive UFO stack (I am committed to its desolation this year) and found particular skirt, which is the fabric you see in the bottom portion of the blouse). It's such a lovely silk charmeuse. It was one of those skirts that I loved because of the lush fabric and the lush print but never wore because of the fit and style. It was time to regroup and rethink what this skirt really needed to be. And it needed to be a top. For a couple of reasons. Though it was beautiful as a skirt, it will last longer and get worn more often as a blouse - case in point as I've already worn it many more times than I ever wore it as a skirt. Secondly, I love the shine of silk charmeuse but it can look more evening that I want it to when worn a certain way and well, even though this blouse is solid silk, I think it can do casual very well. I mean, come on, jeans, kitten heels and a little jacket. Done! Sold! Thank you very much! I did do a muslin of this top. Sometimes I do, sometimes I don't, but I didn't want to risk anything with this fabric since I didn't have very much to begin with. The fit was spot on and I did a little nip and tuck at the neckline because it was trying to flop about. From there the blouse came together fairly easily. I added a fish tail hem as I've found that for me, this style looks really nice. I'm still, still trying to master bias bound necklines. I hate these things. Probably because I insist on doing them in fabrics that are hard to deal with in this way. I mean, silk crepe de chine (the yoke portion of the blouse) is pretty fussy in a bias bound sort of way. Slay me! But I managed. It's the best I've done so far and that's sayin something. I found Jen's tutorial helpful and I also found that smaller is better when dealing with bias bound necklines. Meaning that I found that doing a 1/4" seam allowance (used 1" wide bias binding) works better than dealing with larger widths. The smaller the better in this case. 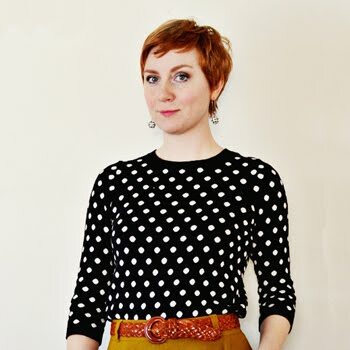 I already have the next two versions of this top cut and sewn - love this top that much! I've been wearing all three a lot. Ha ha! Tops are scarce about these parts and we're reaching critical levels of sartorially challenged mornings in front of my closet wondering why I don't get my fanny in gear and make more tops. This pattern was just the ticket. Not hard at all, fits easily and simply and is only 4 main pieces to cut out. I'm considering a dress too. And I really like the jacket from this pattern as well. Simple silhouettes that are easy to style with other pieces, but also really easy to get creative with and easy to sew. Totally down with that. Are you a fan of these types of tops? The woven t-shirt if you will? Bout time I hopped on this train. Choo! Choo! Love this top! I need to get this pattern. I'm glad you are feeling better, and I hope it continues. I am certain you will figure it all out, certain. I love your roses! What a fantastic use of the fabric. Your top looks lovely - I agree that finding a way that you'll wear such a beautiful fabric more is well worth the effort. I'm turning into a fan of the woven T-shirt at the moment - I always feel much happier wearing them than conventional T-shirts. This looks great as a top! And I understand about the gathered skirt thing…In theory, I should be able to wear such a piece but on they are just plain unflattering on me. Must give the woven tee a go…Thanks for the inspiration! I had to stop and comment on this one. The yoke style tops and dresses being shown lately have done absolutely nothing for me (even go so far as to say I have hated them). But you have totally changed my mind. Your top is absolutely lovely! I love everything about it. About your comment regarding bias necklines and slippery fabric, have you heard about soaking silk in gelatin before sewing with it?? I haven't tried it yet, but have heard good reviews. I lOVE that!! Sorry to hear about how your store is doing...that's rough! Love the top and the fabric, Sunni! And, I threw away my coupons from Joann's this weekend. You are right, we need to support our awesome local stores if we want them to stay around. I love your fabric choices, so beautiful! I am looking at patterns that would be easily adaptable for pregnancy (growing bump) and this one seems to be quite good as there seems to be extra fabric, do you think it would be easy to adapt it? Your top looks lovely! Love the print. I have a woven (sheer print) tank on my cutting table. I loved the print but was looking to make a casual style - I will check out Jen's tutorial before I begin - thanks! This top is gorgeous, thanks for pointing out the pattern. That top is so gorgeous! I am a fan of this type of top anyway, but the fabric is just beautiful. Wow, you have completely transformed that pattern from something meh (simple, functional, but boring) into a wow factor! It's amazing what a beautiful fabric can do for an otherwise "simple" top. That blouse is exactly the type of top I've found myself really loving lately because they're so comfy and can be casual or dressed up a bit. Beautiful fabric! The design showcases it perfectly! Love this! I'm so glad you found a way to make this into a top because the fabric is too beautiful to go unworn! I love pretty woven tops, although I don't have a go-to pattern just yet (have tried a few, but not settled on one that's perfect for my rectangular frame). I love that you can wear them with jeans and a necklace and look totally pulled together. You are very much in the right here! I totally did a double standard and didn't even realize it. It was more a "I've had this pattern in my stash for some time and so I need to make something from it" thing. But I could easily have used the Grainline tee or even the new Belcarra Blouse put out by Sewaholic. Thanks for reminding me that I need to follow my own advice! And the thing is that I totally love the look on others. But it truly looks so weird on me. I keep trying with no luck! I have hear about this and actually hear good reviews as well. Definitely worth a try probably! Though I will say that once you start getting the hang of working with drapey silks it gets much easier as you keep practicing. So inspiring! Though someone did call me out on this in this post and I didn't even realize it! I used a Simplicity pattern when I could have and really should have used an independent instead! My bad! But yes, I too have thrown out the Joann and Hancock coupons. I am resolved to get my goods from a small independent somehow or someway! Totally easy to adapt I think! There's a lot of room in the top and I would say that you could probably wear it for awhile before having to move onto something else. Is this fabric from your shop? If so how much I would love to have a few yards. I think that is so smart to turn the rarely worn skirt into a blouse! I wear the blouses I've made so much more any of my other handmades. They fit my style better. And it turned out so beautifully! I love it! That color is amazing on you! I've been reading your blog for a while now, and I just feel the need to say that you are a lovely young woman, and it is clear how much talent you have, how capable you are, and how much you care. You are to be commended for taking such a brave leap into the world of owning a shop, not to mention leaping from being a flautist to a seamstress-type! As a former choir-director-turned-business lady, I struggled with the pressure of feeling like I failed as a musician, when really, I just chose a different life, even though I succeeded in the choral world, too. No matter what the outcome of this shop, you are, and will be a success, because you were brave enough to take the leap into the unknown. I encourage you to look up "The Perfect Wrong Note" by William Westney. Obviously it is directed at musicians, but it has really wonderful insights for struggles in life, and releasing the perfectionist in us from feeling them as failures. I'm not obsessed with psychological stuff, but sometimes discouraging feelings just need to be wrangled back in through words of a wise and talented sage. YOU are lovely and successful! Oh, and great blouse! Absolutely one of my all time favorite makes of yours! Very practical, VERY inspiring. This is beautiful and a great use of the fabric. Just lovely! Looks great. I love that you have reused a skirt for the bottom portion. I do this with skirts I don't wear any more too but I make the into dresses for my girls. this is beautiful! i'm completely on board with the woven tee. it's easy to wear them with jeans or more dressed up if the need arises. the bias faced necklines are such a hassle in slippery fabrics though. i keep thinking i should try to use a more stable cotton lawn/voile bias tape, but i never remember or have on hand what i need! Sunni, I love that fabric! And it really looks great on you. Normally I prefer fitted tops, but I recently tried to make two looser tops. I have mixed feelings about them. One I didn't like both due to the fabric and pattern. The second was better but two very close persons told me it made me look older. I still haven't posted them on my blog. I made this last summer in linen and I love it. Beautiful fabric!